I remember when I was in college I would flip through the course catalog a couple weeks before class registration opened and get way excited. Each class sounded better than the next. Somehow they even made Physics and Statistics sound exciting (they aren't). Of course I would then go to the first day of class and realize it was not going to be the sugary treat that I expected . Half of the time the content was completely different than written. What a let down. I still take classes but now I make sure I know what I am going to get before I get there. I can tell you that Casey Trees classes and workshops are gold and the value is crazy insane - either free or just $10.00. I've spent that much on a hot dog - which may or may not have been green - at a DC United game. For those of you have not signed up for a Treescape Design Workshop (Wed. Sept. 9 and Tues. Sept. 15, 6:30 p.m.-9:00 p.m.) yet, listen up. It's go time. This workshop is taught by seasoned landscape design professionals and arborists who not only know their stuff but how to make information on trees interesting and engaging. You get to bring in simple sketches or photos of your yard and work with these folks to design a treescape plan that works for you. You say "I want shade". We will tell you where to plant. You say I" want seasonal color". We will say what tree to plant. You want to know how to plant a tree. We will tell you just what to do. What you walk away with is a solid plan for your yard, direction, and confidence to get it done. 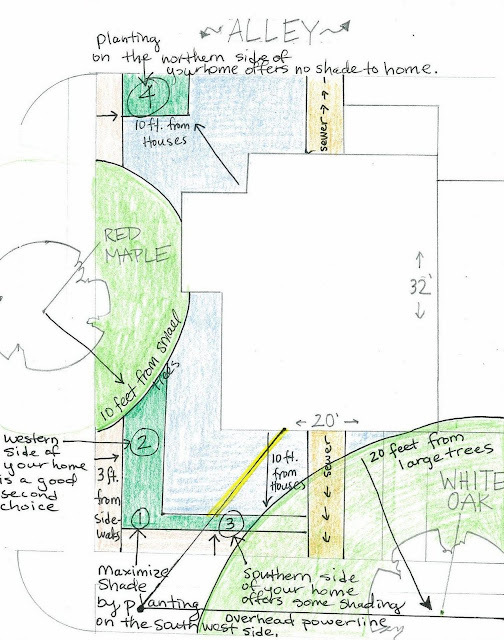 Above is a sample landscaping plan from a previous Treescape Design Workshop attendee. You can see serious thought went into it - where existing trees and powers lines are located, how to maximize shade, and even options. And let's talk about the FREE shade tree you get delivered to your house during the fall planting season. Not only do you not have to go to the store, struggle with which one to buy, worry about its health, or lug it back to your house, you get the tree for free. Who does that? Angels and Casey Trees. Casey Trees is also open to taking the Treescape Design Workshop on the road. If your civic association, church group, etc. want to host a Treescape Design Workshop, all you have to do is provide the venue, guarantee 25 participants, and either pay $10.00 per person or host a meal/refreshments for all the attendees and instructors. Of course all the trees must be planted in DC. Think about it and lets get some trees in the ground. Sign up here.